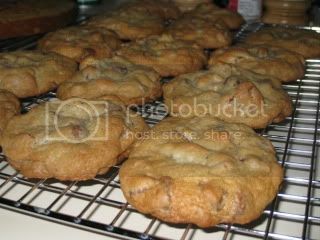 Janetha asked me to post the recipe for the cookies that I always make for The Husband, my family and friends. So, in playing a little catchup since I made THESE a few weeks back, here is the recipe. These are not so low cal and they are insanely addictive! 1. It’s important to use BOTH margarine & butter to keep the consistency of the cookie. All butter = a runny, flat cookie. All margarine = a hard, crispy cookie, together you get the perfectly crispy, chewy, gooey, LOVELY cookie. 2. Chocolate Chips ~ I LOVE using the giant Guittard Milk Chocolate ones with the Nestle Semi Sweet, however, any brand works ok. COMBINE flour, baking soda and salt in small bowl and set aside. Beat butter, granulated sugar, brown sugar and vanilla in large mixer bowl until blended and fluffy. Add eggs one at a time, beating well after each addition until well blended. Switch to a wooden spoon and gradually beat in flour mixture. Stir in morsels and nuts. Drop by rounded tablespoon onto ungreased baking sheets. BAKE in preheated 375-degree [Fahrenheit] oven for 9 to 11 minutes (my oven works perfectly at 10 min and 45 seconds) or until golden brown. Let stand for 2 minutes; remove to wire racks to cool completely. Jenny ~ They ARE that good. I cannot be trusted to be left alone with them. K ~ You really do need both chocolates to create the best flavor. I’ve tried it with just one chocolate and it just isn’t the same. oh goodness these sound amazing!!! Peacelovepb ~ They are really good – they don’t last long whenever I make them. hello can you please tell me how many cookies your choc chip cookie recipe yields, im trying to plug recipe in WW…Thanks!! For the cookies, it depends on what size you make. Here is the breakdown. These are estimates but it is the approximate amount I get when I make them – good luck and I can’t wait to hear what you think. I will update the post on the cookies to include this information. These are the BEST ever and I keep coming back to this recipe. I could eat the whole batch…just got to keep them away from everyone else! !